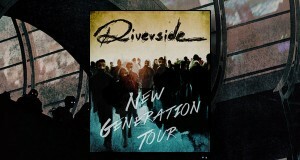 The time has finally come, please welcome Riverside and Jolly as they come to our stage tonight! “I ordered tickets already, but never received them” If you have a paypal confirmation your name WILL be on the list at the door. “Can I still purchase tickets?” There are a limited amount of tickets still available, you may purchase them at venue beginning at 6PM CASH ONLY, $35 per ticket. “Is this a standing or seated show?” This is a seated show, but we expect you to be out of your seats and on your feet showing love for these two amazingly talented bands.